Published Jun 19, 2017 By Julia Leave a CommentThis post may contain affiliate links. Make this healthy and easy olive oil pasta with chicken, fettuccine, and a simple basil pesto sauce. Today’s recipe is all about minimalist yet interesting ingredients. I’m keeping it simple with this olive oil pasta by using just a handful of ingredients: olive oil, fettuccine pasta, chicken, basil, citrus juice, and radish. It’s healthy, light, and easy to make. If you’ve never tried kumquats before, here’s your chance. They are small citrus fruits that resemble oranges, although much smaller in size. They’re available at most supermarkets during summer months and you can eat them with the peel on. 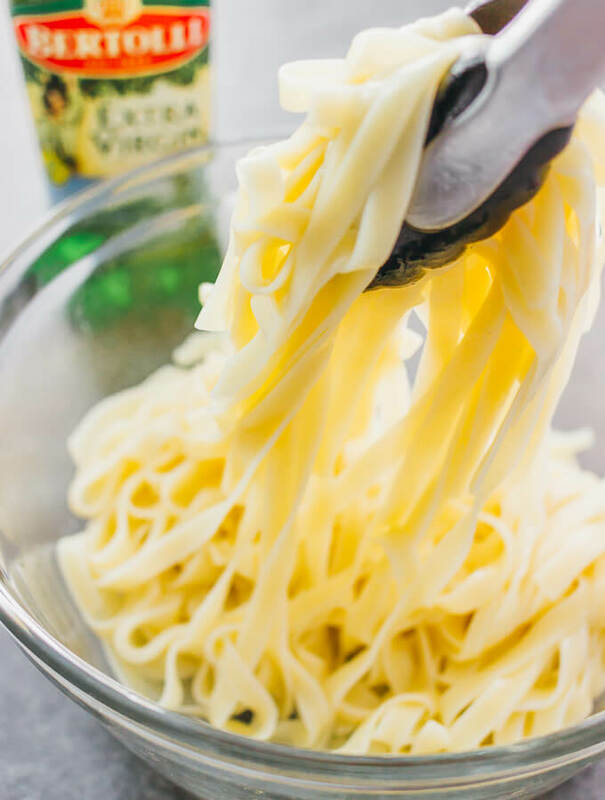 You can add kumquats to salads, preserve them, or use them in a sauce like I did with this olive oil pasta. 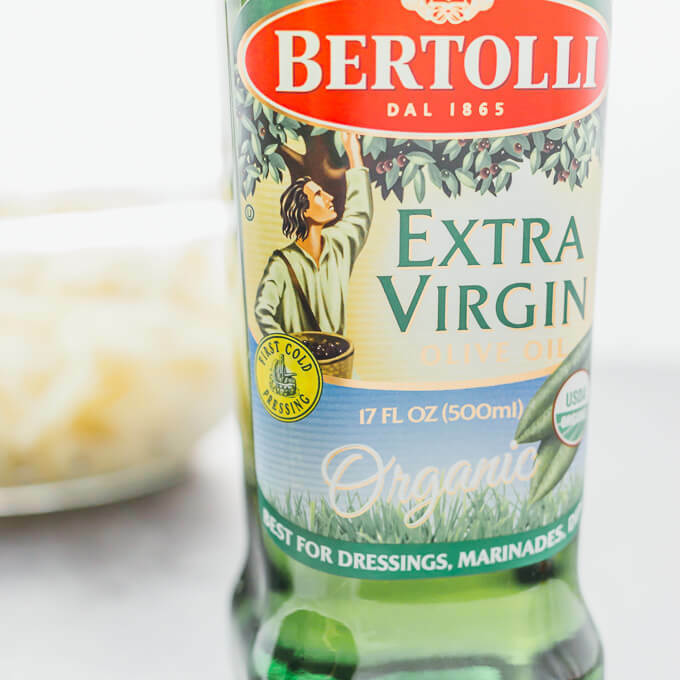 I used extra virgin olive oil by Bertolli — they have been making olive oil for over 150 years and are known for premium-quality non-GMO olive oil. Additionally, it’s produced using organic olives and with ethical farming standards. I use their olive oil in nearly all of my dishes, especially healthy and simple dinners. You can find a local grocery store near you to purchase Bertolli olive oil by checking out their store locator. 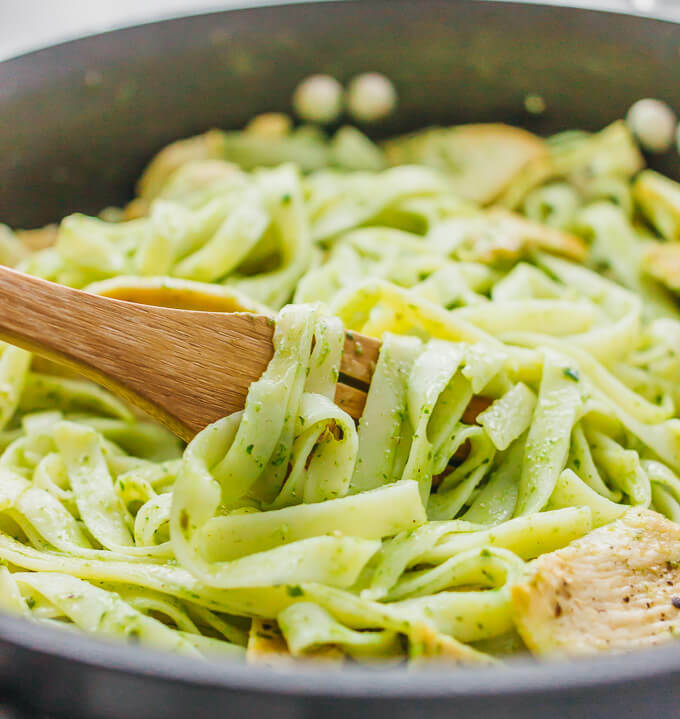 The sauce in this olive oil pasta is a really basic, barebones pesto sauce. It’s mainly olive oil and fresh basil leaves, plus a tablespoon of kumquat juice or any acidic fruit juice such as lemon or lime. All three ingredients are blended together until combined and smooth. This sauce gives the dish a bit of flavor without overpowering the rest of it. 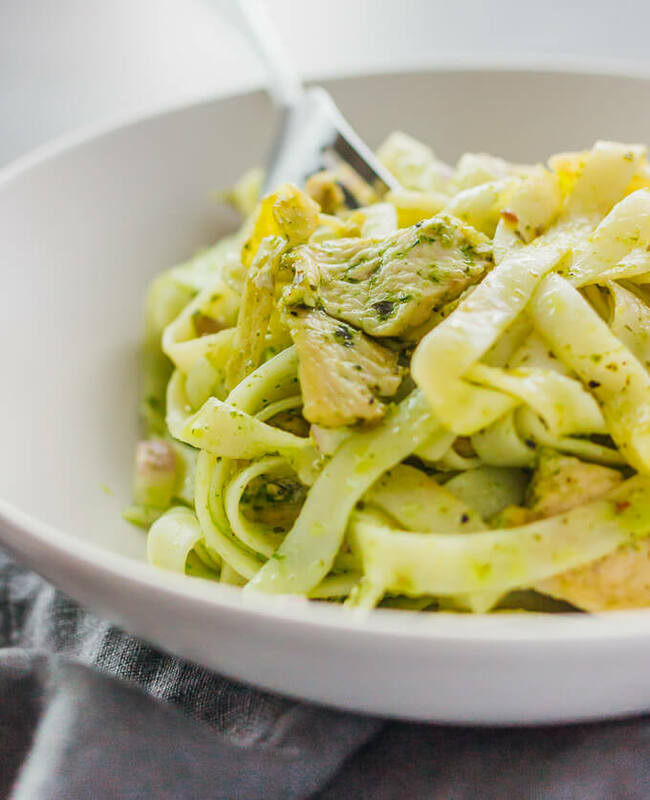 If you’re looking for a more complex pesto sauce, you can try my homemade broccoli pesto, parsley pesto, or mint pistachio pesto. 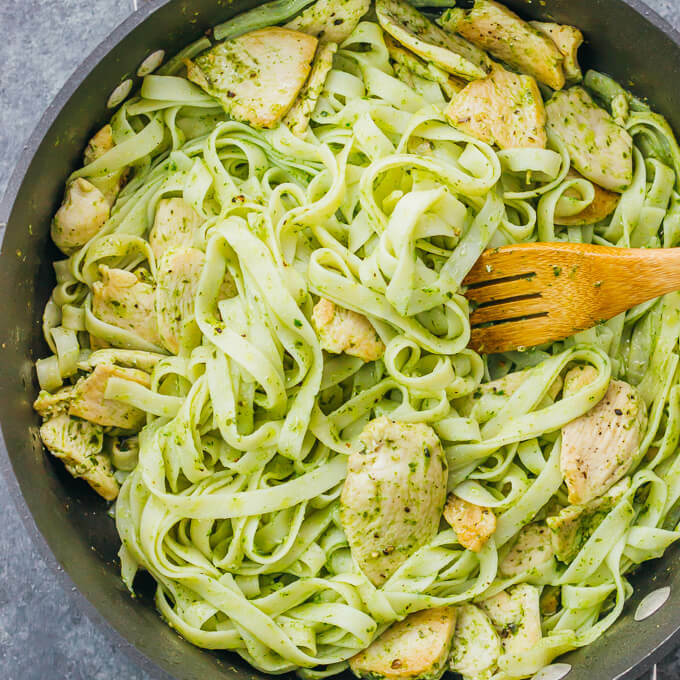 A healthy and easy olive oil pasta with chicken, fettuccine, and a simple basil pesto sauce. Cook fettuccine according to package instructions. Drain, toss with 1 tablespoon of olive oil, and set aside. Blend all sauce ingredients together until well-mixed. Set aside. Heat 1 tablespoon of olive oil in a 3 quart or larger pan over medium heat. Add chicken strips and increase heat to medium-high. Season the exposed sides of the chicken with salt and pepper. Cook until lightly golden and cooked through, stirring occasionally. Reduce heat to medium-low. Add fettuccine, radishes, and sauce to the pan. Stir until everything is well-mixed. This is a sponsored conversation written by me on behalf of Bertolli. The opinions and text are all mine.